When I hear people talk about detoxing I cringe. The reason for this is that for many people detoxing means they are doing a crazy program, whether its just juicing for a week or its doing what some call the master cleanse which is cayenne pepper, lemon, ginger type of program. What I see with these types of programs is that for those that are pretty healthy, they can be helpful, but for those who are filled with inflammation or are dealing with health issues what this detox does is release the toxins from the fat cells too fast and many peoples bodies can't handle it. Our true detoxification channels in our bodies become overloaded. Our kidneys, liver, lungs etc can't handle all of these toxins at one time and people get really sick. Dandelions are one of the best plants to use in the spring (or really any time of the year) to cleanse our body. This week dandelions are popping out all over the place. Might as well use them as within a week or so the flowers will be gone. Dandelions are tenacious plants. They are known for surviving almost anything and they spread themselves far and wide. Dandelions are tough. Have you ever tried to pull a dandelion root? She likes to leave just a little bit of herself so that she can keep growing. People who need dandelion are hard working, over-stressed and irritable. They cram too much into each day. They need to learn to let go. Dandelion and its herbal remedies work directly to relax and cleanse the liver which is where over-driven people tend to store their anger and frustration. On an energetic level, I see dandelion as being very free and giving. Our society tends to be emotionally constricted and tries to cover and shove down all negative feelings or cover them up with pharmaceutical medications. This spring look at all the dandelions that are surrounding us. they are shouting to us that they can help us help detox our bodies, let out some of the stored anger and let our emotions flow and release. Happy Spring, may your spring be filled with lots of beautiful warm days, flowers and relaxation. 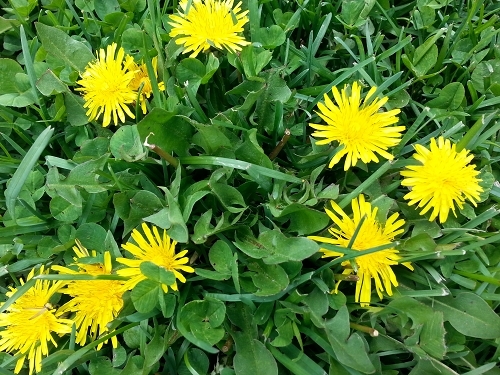 Bonnie, I may have found another revenue stream for myself: With all the dandelions growing on my property, I could make gallons of detoxifying dandelion oil and become wealthy beyond my wildest dreams. :) Seriously, though – could I use the oil on salads as well as on muscles? Or is that going too far? Thanks for the great idea and explaining why a more aggressive detox can be a bad idea. Detoxing always seemed like an interesting idea but it’s such a fad I was hesitant to try it. I did do a sugar detox recently and had a day or two of crazy low energy but was very glad afterwards. I can totally see your point that if I had any underlying health issues that could have really set them off in a back direction. I had no idea that the dandelion could also be made into an oil that was so useful. Lucky me the park had loads of them growing and they do not spray anything over there. Thank you for such a helpful tip! Thanks for this Bonnie! I do find in clinical practice that very often people are taking dandylion because they thing that it’s a good thing to do – and it’s NOT good for their particular circumstances. Dandylion is potentially strong medicine! Bonnie, luv ur approach. The way u explain things is so easy to accept and understand the basic principles. Ur very down to earth :) The cayenne pepper I do more so in fall/winter for circulation and warmth. Ginger for inflammation ( which is a big problem that many conventional doctors never diagnosis). Lemon I do alot. Not as much of the other two, just as needed but dandelion I have lived on. I’ve never heard it explained like u have and u put ot into a clear perspective. Thanku for ur wisdom.